I hear them often these days, statements about “Drinking the Kool-Aid” as a metaphor for blindly following someone or something. Each time I hear it, I realize that so few people today really know or understand the source of the phrase. And that is why it is so very important to continue telling the story of Jonestown, so current and future generations will understand why that phrase was so painful, why it is now so prevalent, and why it is so timely. 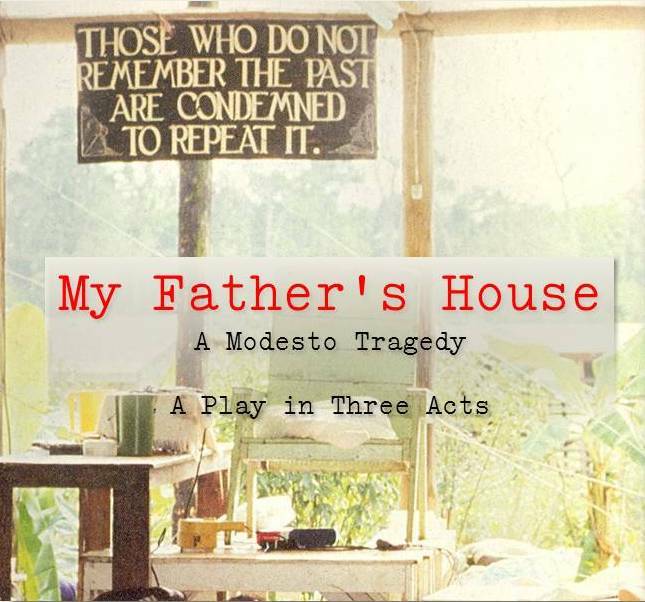 When I produced the original staged reading of my play, My Father’s House, I spoke during the talk-back with some of the younger members of the audience, including my niece. They had heard the phrase, but they knew very little about the actual event. They vaguely recalled hearing about Jonestown in a high school class, but their knowledge was superficial at best. They just didn’t know the history. The ultimate message of my play was, is, and continues to be one of vigilance: the urgent need to constantly pay attention to what is happening around us, to question anything that seems unusual, and to get involved in whatever way we can to change things. Vigilance is especially critical in today’s social, cultural, and political environment, as is inquiry and action. These are the critical roles played by the arts. To inspire, inform, and entertain. To raise awareness and promote involvement. To ask questions. To examine our world, even if it’s painful and uncomfortable. I have had discussions in the past year about resurrecting the stage play because of its timely themes. I have spoken with our local theater groups, commercial and collegiate, about doing the play. There is some interest. Unfortunately, the current version of the play may be too complicated for our small theater groups to mount. However, that will not prevent me from having the conversations. By continuing to tell this story in as many forms as we can, we hope we will never have to use the phrase again. And if we do – which I suspect we will – my hope is that people will forever understand what it means and where it came from. Last modified on October 9th, 2018.